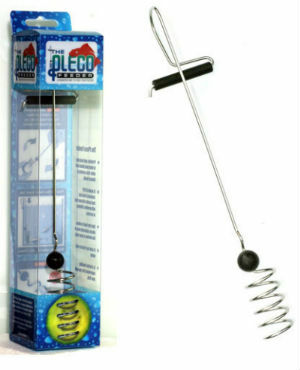 The Pleco Feeder was born out of a need to have an easier way to feed plecostomus. Are you getting tired from tying a piece of zucchini to a rock then getting my arm wet? 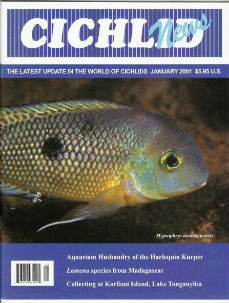 Enter the most innovative and convenient way to feed catfish, The Pleco Feeder. It is made from 316 Stainless Steel and food grade silicone rubber and will provide a lifetime of service. This model is 9 7⁄8 inches long. It will work well in most 5, 10, 15, 20 Long, and 20 gallon aquariums. More sizes are coming soon. 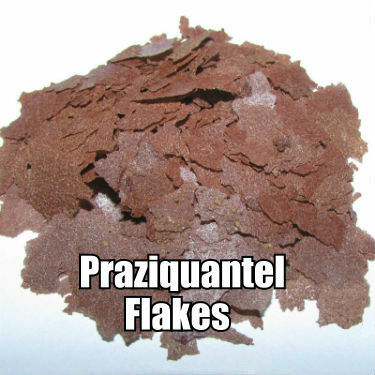 It makes feeding your plecos and other aquarium fish a varied healthy diet quick and easy. Just screw a piece of fresh shrimp, zucchini or any vegetable and place it in your tank. A healthy fish is a happy fish. Start giving your fish a healthier diet today. 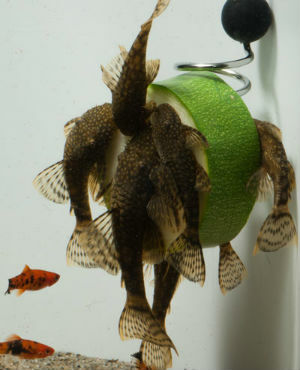 The Pleco Feeder makes feeding them nutritious food quick and easy.